It was a downright miserable evening in Charlotte, NC on Saturday at the PNC Music Pavilion. But the near 100-degree heat and high humidity couldn’t slow down the scorching performances of Steve Winwood and Steely Dan. This tour was a stop on Steely Dan’s “The Dan Who Knew Too Much” 2016 Tour. (Yeah, they do come up with some unique tour titles.) 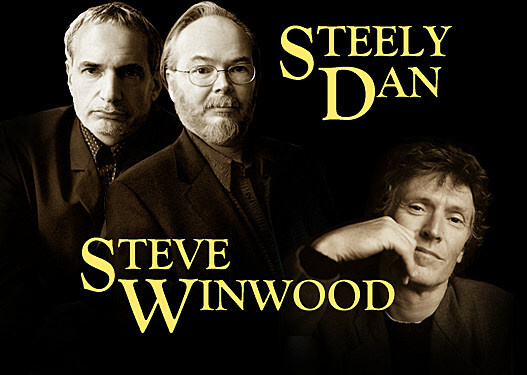 Steely Dan have been road warriors the past few years – showcasing their unique style of jazz infused rock. It’s odd for audiences to give standing ovations to opening acts, but that’s exactly what happened to Winwood. As fans shuffled in for the Steely Dan show, the true fans of quality music were already seated and had their eyes glued to Winwood and his sharp band. These were not fake golf clap standing ovations; these were yell at the top of your lungs and stand up high while flailing your arms type of standing ovations. That is very rare to see these days, but everyone was impressed with Winwood and his band’s musical precision. Winwood mainly sat behind the keyboards, but on several occasions he got up and played the guitar. He did give a masterful performance of “Dear Mr. Fantasy” – where he performed an extended guitar solo. The legendary Winwood showcased an array of songs from his solo career, Spencer Davis Group, Blind Faith and Traffic. Winwood could easily go on a tour of his own and put on a longer show. We’ll be waiting for that. Steely Dan’s backing band came out and played the instrumental “November Afternoon.” Donald Fagen and Walter Becker, the duo known as Steely Dan, came out with The Danettes, the backup singers. It was just a simple stage setup with a black background. Some kaleidoscope images appeared throughout the evening on the backdrop. It was almost like Steely Dan wanted you to focus on their splendid musical offerings instead of bells and whistles. The classics kept coming with the likes of “Black Friday,” “Kid Charlemagne” (Their usual encore in the past) and “Bodhisattva.” In between songs, Fagen frequently wiped his head off with a towel. It was still hot and humid on the stage even with fans blowing on the band. The only negative (other than the heat) was that Steely Dan had the volume turned up to accommodate the massive venue. That kind of took away from the crisp, clean sound of the jazz infused music. The Danettes did get a chance to shine with lead vocal duties on “Dirty Work” and “I Want To (Do Everything for You), which included band introductions. Jon Herington and Becker shared lead guitar duties throughout the night. They seemed to have different tones, which in return complemented each other. The two-hour show was bitter sweet because the heat and humidity made it dismal, but in return we got to see one heck of a unique show.